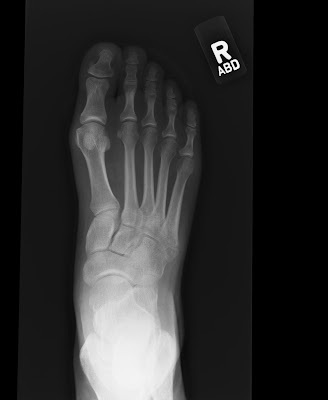 So I went back to the ortho about my broken foot today. This was my 8 week appointment. I was hopeful to be moving forward, getting out of the boot. The news was not good news. I was so nervous and nelly and scared going in. 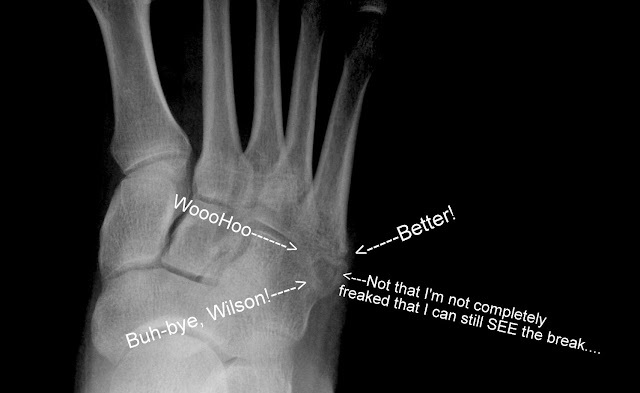 I hobbled in, wearing ole Wilson, and thinking, I just hope it’s healed, I just hope it’s okay. And I am so tired of the sound of Velcro. My poor naked foot, in such desperate need of a pedicure. The news was freaking grrrrrrreat! Great news! I left you abandoned on the side of the road after my appointment. (Okay, no I didn’t). Hello two shoes! A tale of two feeties! After the appointment, I immediately put on my Brooks Adrenaline and went for a five mile run. (Okay, no I didn’t). The plan? No running for four more weeks (booooo), but I can bike (yay), swim (yay) and walk/eliptical, just no impact. I am okay and cleared to do IronGirl Atlanta (May 20), but I just will walk the 5k part (or a slow, slow careful jog). I am also supposed to wean myself out of the boot. But that’s just not likely. We (the Expert and I (smile)) do have an event tonight at Georgia Aquarium for the Getting 2 Tri Foundation, where I would normally wear heels. But I will never wear heels again. And certainly not tonight. Okay, so maybe no heels for a long time. The first few steps in sneakers for the first time in 8 weeks was very strange. I think the mental road back to running is going to be just as tough as the physical. 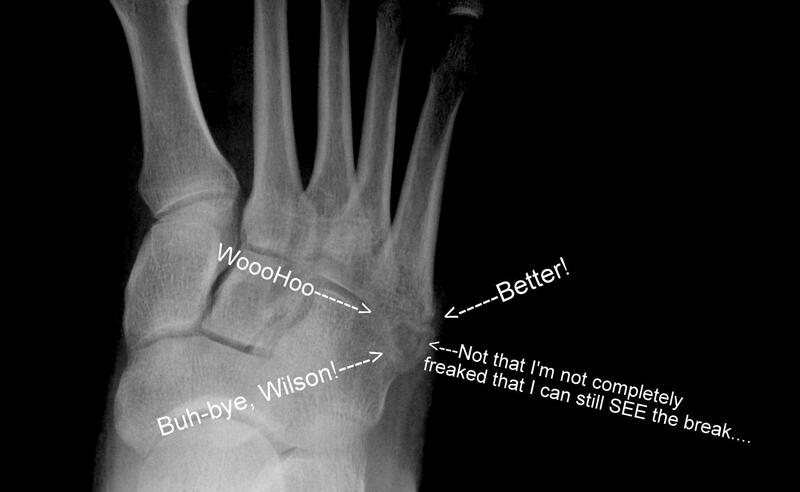 Afterall, I can still see the boo-boo on the x-rays. The doc said that I may be able to see it years from now. How that effects my mental game, my running stride, my chicken wing… I’m interested to see. And you don’t have to worry, I will tell you guys alllll about it… in excruciating detail. “Triathlon is a Mother” tech shirts. Last day. Last day. Last day. And I still want your triathlon stories! I Ate That. I Hate Me. Yay!! Bye Bye Wilson! SO very happy that you got great news and you are getting better. Yes, the mental game is a tricky one but I have no doubt that you will rock on right through it. I logged on just to see how your appt went. Woo hoo! So happy for you. Keep your head up and rock on sista! woot! woot! So glad to boot is gone! Woohoo! So glad you get to say buh-bye to Wilson. Awesome! Awesome news! Coming back from an injury is tough. I struggle with every little ache I have wondering 'oh no! is that a 'bad' pain or normal training pain'? Be patient with yourself. I hope to meet you at Irongirl. Will you being setting up an official meet up time? Thanks, y'all! Bluegrass – I hope to do a post-race happy hour… so stay tuned! Been there, done that. So glad you're healing, take it slow getting back to the run, not that I would though. Hallelujah! I just started reading your bloggy but I can't imagine the frustration of being in that darn boot. Looking forward to hearing about your journey going forward. I'm doing my 1st 5 mile run next weekend and then my 1st tri in Aug.
Great! I'm smiling for you to be rid of Wilson. When I first started to read your post, I thought oh no, she still has to wear Wilson for a while, but I'm SOOOOOOOO happy that Wilson is GONE!!! Yay!!! Congrats!